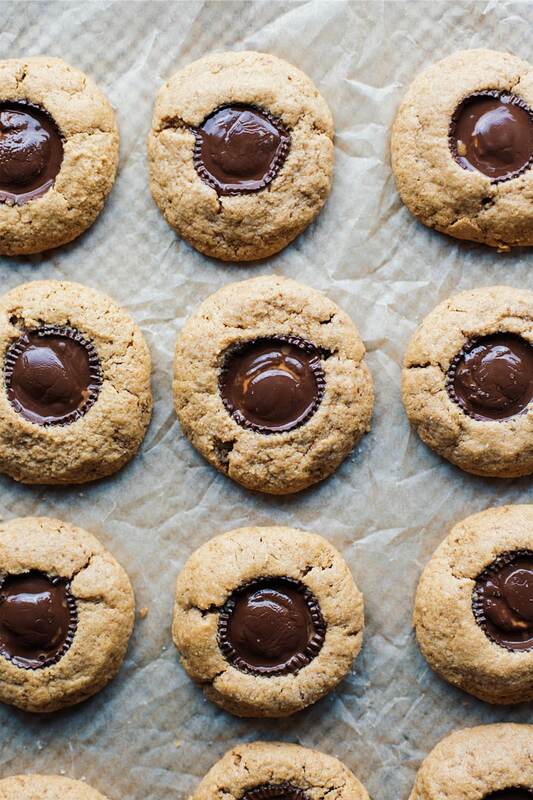 The most decadent and delicious peanut butter cup cookies. Rich in taste, irresistible in texture, and a sure crowd-pleasing dessert. 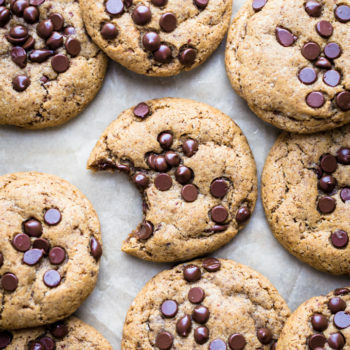 Anyone and everyone will love these gluten free cookies and never know they were healthier! It’s Christmas cookie season! 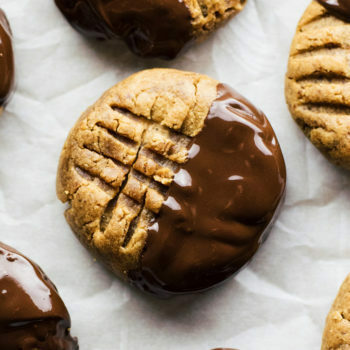 And these Gluten Free Peanut Butter Cup Cookies are outrageously yummy and festive. 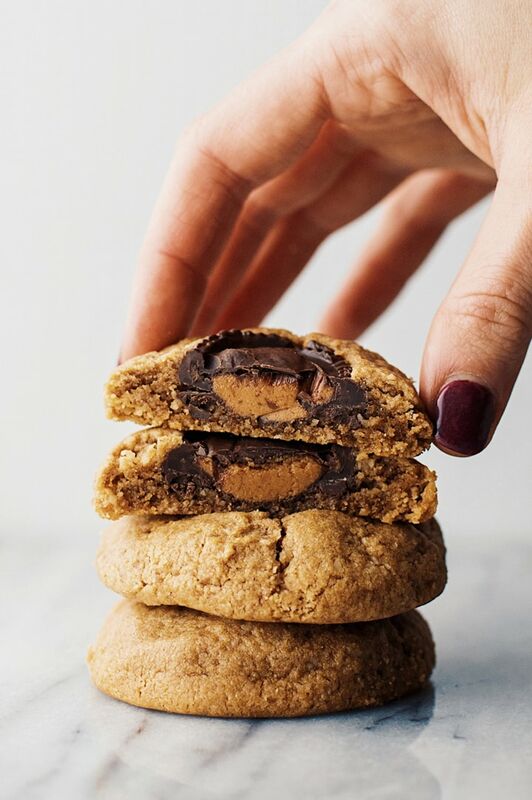 All you need is one bowl, 10 healthy ingredients, and you have yourself the most melt-in-your-mouth peanut buttery cookies with a decadent chocolate center. Enjoy these soft and chewy cookies for the holiday season or anytime of the year! What I love about these cookies is they don’t even taste like a healthier cookie. They are rich in taste, irresistible in texture, and are a crowd-pleasing cookie for any occasion! First, mix dry ingredients with wet ingredients – cover bowl of dough with plastic wrap or lid and place in freezer for 30-45 minutes or refrigerator for 2 hours for dough to chill. Remove dough from chilling – use a cookie dough scooper then roll cookie dough in 1 1/2 inch balls with hands. Place peanut butter cups on top of dough balls and gently press down into the center. Pinch/seal cracks in edges of cookie. Bake at 350F for 10 minutes – then let cool for 10 minutes. Can I freeze Peanut Butter Cup Cookies? These cookies are great for freezing and actually taste quite yummy slightly chilled. Freezing the dough: You can freeze this dough for 1-3 months, then remove dough and follow directions as is to make cookies. To freeze the cookies: follow directions and bake cookies, then let cookies completely cool before placing in a ziplock bag or sealed container to freeze. 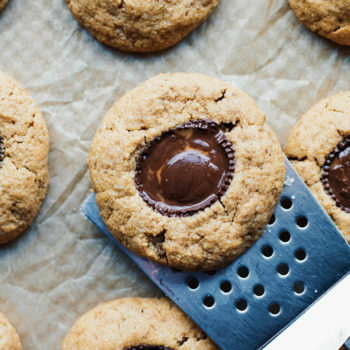 Traditional peanut butter cup cookies are baked in a muffin tin. If you prefer your cookies to be less “cookie” shaped and more “cup” shaped – bake these cookies in a greased muffin tin rather than on a cookie sheet. This step is not included in my recipe nor is it needed. If you are looking for a cleaner peanut butter cup brand to “stuff” your cookies with – I use Justin’s Mini Dark Chocolate Peanut Butter Cups. 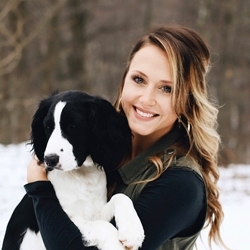 I love the taste of them and the simple, clean ingredients this brand uses! Other brands work for this recipe as well. 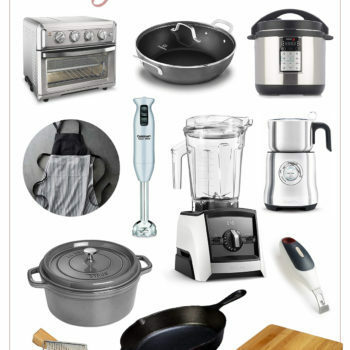 Instead of almond flour, you can substitute with a gluten free flour blend or with regular all-purpose baking flour. If You’re a Peanut Butter Cookie Lover..
Rich in taste, irresistible in texture, and a sure crowd-pleasing dessert. Anyone and everyone will love these gluten free peanut butter cup cookies and never know they were healthier! Create dough: In a small bowl mix dry ingredients together - almond flour, baking soda, salt, and cinnamon. In a large bowl cream together butter, sugar, vanilla, and peanut butter. Then slowly mix in egg. Add dry ingredients to wet, mix until combined. Chill dough: Cover bowl with plastic wrap and chill dough in freezer for 30 - 45 minutes or the refrigerator for 2 hours. When dough is chilled preheat oven to 350F. Use a 1 1/2 inch cookie scoop to measure dough - then roll into ball using hands. Bake cookies: Line a cookie sheet with parchment paper. Lay dough balls 3 inches apart on cookie sheet. 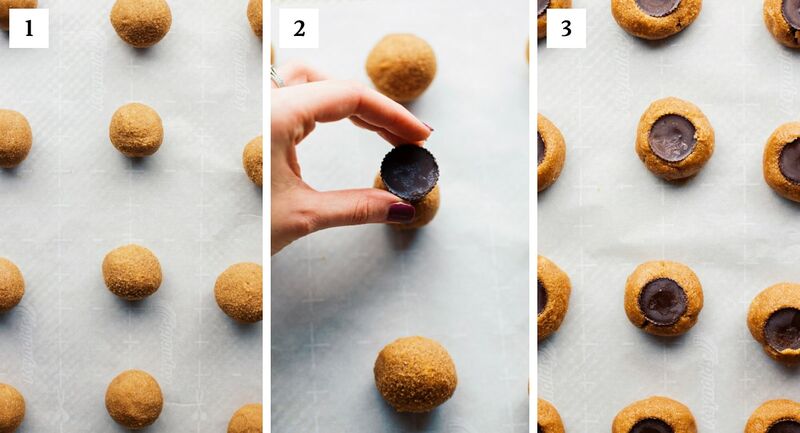 Take peanut butter cup and place at the top of the dough balls, then press the peanut butter cup gently into the center of the dough ball. Seal/pinch any cracked edges of cookies if needed. Bake cookies for 10 minutes - then remove and let cool for 10 minutes. Store in a ziplock bag or sealed container at room temperature, refrigerator, or freezer. 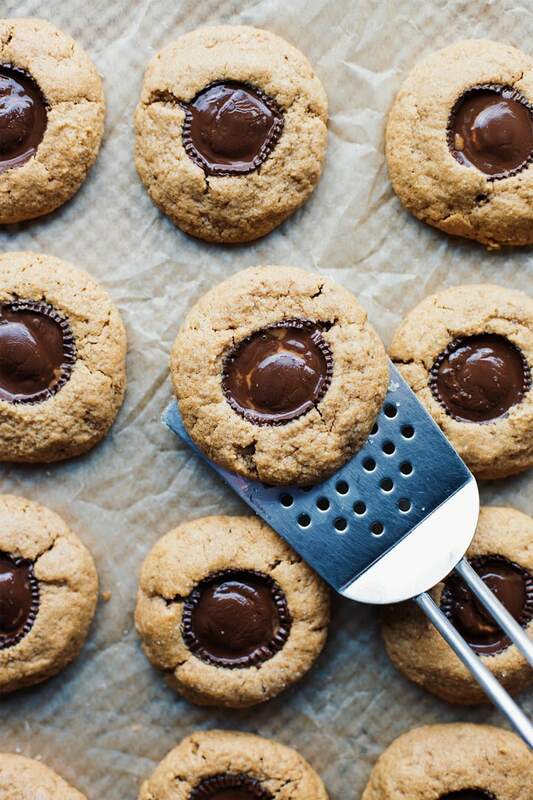 Traditional peanut butter cup cookies are baked in a muffin tin. If you prefer your cookies to be less "cookie" shaped and more "cup" shaped - bake these cookies in a greased muffin tin rather than on a cookie sheet. This step is not included in my recipe nor is it needed. If you are looking for a cleaner peanut butter cup brand to "stuff" your cookies with - I use Justin's Mini Dark Chocolate Peanut Butter Cups. I love the taste of them and the simple, clean ingredients this brand uses! Other brands work for this recipe as well. Instead of almond flour, you can substitute with a gluten free flour blend like this one or with regular all-purpose baking flour. Made these last night and they turned out amazing! They are especially good 10 mins or so out of the oven when the chocolate is still slightly melty. I will definitely be making these again!